Bio: Marc Hanson was born in Oxnard, California in 1955. As his father was in the U.S Air Force the family was successively posted to Alaska, Florida, Arkansas, Nebraska, South Dakota and Norway. When his father retired the family settled in the small northern California community of Loomis where he finished high school. His father was a talented artist and Marc inherited the gift. He began college as a biology major but because of the amount of illustration that he was doing in his papers, he decided to switch to art. He majored in illustration in Pasadena’s Art Center College of Design in 1978. Marc moved to Minnesota in 1979 and has been a practising artist there since. His has worked as an illustrator on National Screenprint, and for the National Geographic Society. Mark won awards for three years in succession in the Pastel 100 competition in the Pastel Journal. He is a Signature Member of the Oil Painters of America. Style: Representational. A lot of plein air work. 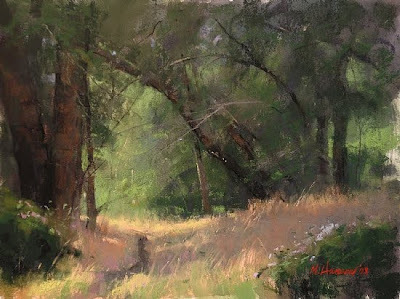 Gallery: There is a specific Pastel gallery, but Coleman Fine Art has nine pastels in its collection, two in the Waterhouse Gallery, and there’s one in Cornucopia Fine Art, so check out the art galleries too. Image View: Each thumbnail in a gallery may be enlarged; the enlargements may be viewed serially using the forward and back arrows; and the image may be further enlarged. This enlargement is also in a series, so using the back and forward arrows brings you to the next enlarged image in the series. This is very useful, as you will want to see all of Marc’s paintings. (Don’t miss the oils either). California Trail is 9x12 ins, 550x411, 227 KB. Blog: Yes, but with an oil rather than pastel focus.